Installing lights in your garden can completely transform your outside space. Outside lighting can act as a feature (as with Christmas lights), security (motion sensor flood lights), and mood lighting. Combined with heaters and BBQs, it can also present a lovely space for entertaining guests in the summer. If you’re considering lighting up your garden this year, there are a few lighting solutions you will need to consider before you start buying lights. Smart lighting technology is taking over the market, as people turn to easier solutions for managing their lights and energy use. Many brands are now starting to offer more smart technology products for your home, most notably Philips, the lighting industry leader. With smart lights, you can remotely control the lighting outside your home via an app. They are most commonly utilised at Christmas with light displays outside homes, however you could easily use smart lighting technology in your garden throughout the year. If you didn’t want to go through the hassle of fitting light fixtures outside your home, there are other options available with less hassle and cost! Solar lighting is increasingly popular, due to the ease of use and installation. They require no mains power and don’t cost anything to run, making them the most efficient garden lighting solution! Solar garden lights come in many forms, from steel spikes to wall lights to motion sensors. If you want to light a path or driveway, then LED solar rope lighting could be the perfect solution! No wiring is required, they’re waterproof and easy to install. The solar panel spike which is attached to the rope lights converts sunlight into energy, which is stored in the rechargeable battery until it switches on at dark. 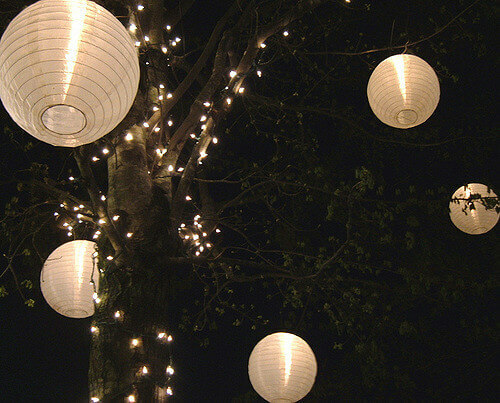 If your garden is on the smaller side and you don’t want to waste space with lighting fixtures on the ground, string lights could the the solution for you. Drape them overhead or alongside your garden wall to maximise on space. If string lights aren’t for you, consider lighting paths solar lights, wrapping LED rope lighting around your trees or using wall mounted lights. All of these alternatives allow you to light up your garden, without losing any space. The most important thing to remember is that you only use outside lights outside. As simple as it sounds, there have been many occurrences of people using indoor lights outside, which results in disasters. This is because outside lights have an IP rating (Ingress Protection), this tells you how well protected the light fitting is. The IP rating includes two numbers, the first of which shows the rating for protection against solids like dust and the second rating tells you the level of waterproof protection. The higher the IP rating, the better protected the light is! However, if the first number on the rating shows an ‘X’, this means it hasn’t been tested against solid objects. Different light fittings will have different IP ratings because of their purpose. For example, indoor lights are not suitable for outside because they won’t survive severe conditions, like cold and rain. If you plan on having any light fittings installed and electrical work carried out outside of your home in England and Wales, then you will have to comply with Part P of the Building Regulations. It requires that the light fitting is carried out by an electrician who is registered with a competent person scheme or that you notify the Building Control department of your local council if you aim to have any electrical work done in your garden. The electrician must make sure that the electrical work outside of your home meets Part P and also, in some circumstances, that it is energy efficient. It’s important that any socket, lighting fixture and appliances used outdoors has proper RCD protection. Residual Current Devices will help protect you in case of a fault or accident, as they will instantly cut the power should anything occur. You should never leave cables or leads loose around the garden, as they are at risk of getting damaged with lawn mower and hedge trimmer. Remember to fix cables against buildings, off the ground and in plain sight. Enjoyed reading about outside lighting ideas? Then take a look at our kitchen extension ideas to complete your home transformation!